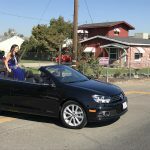 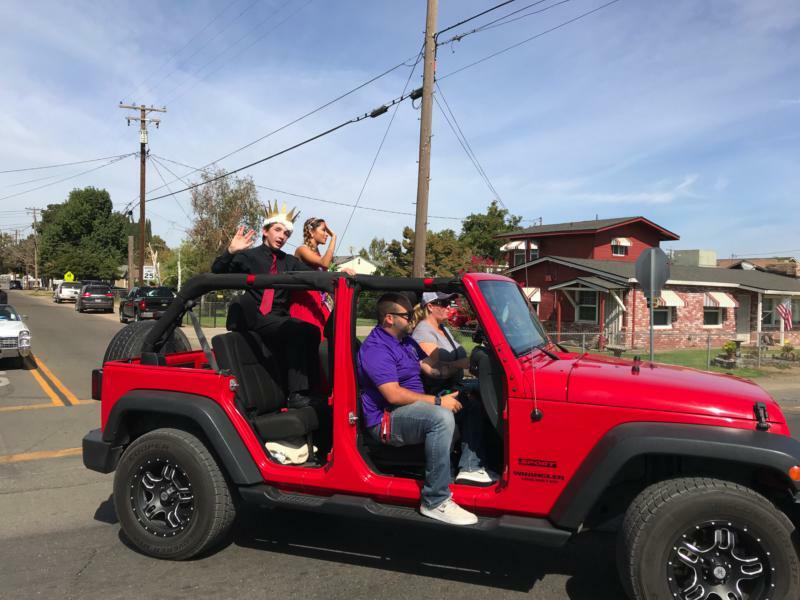 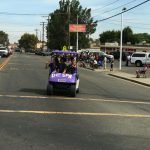 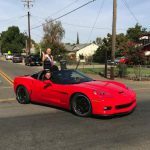 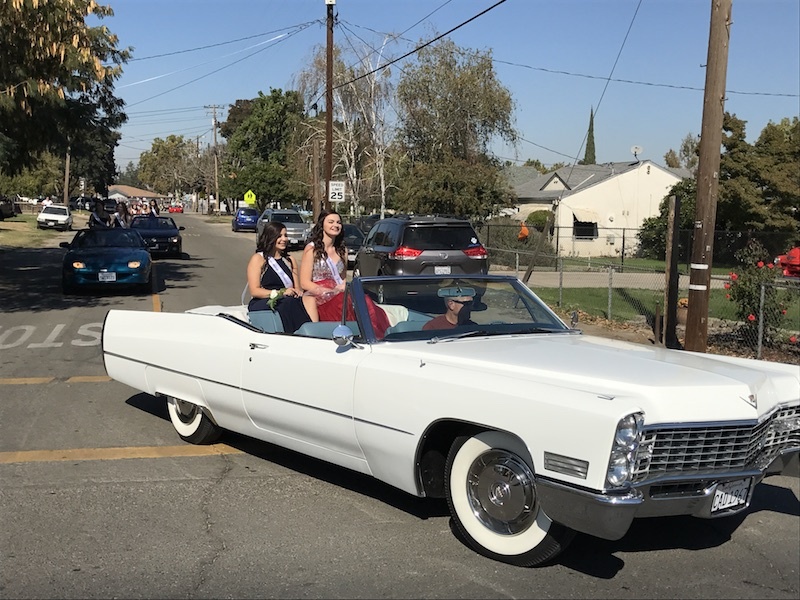 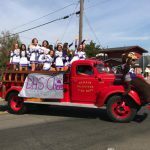 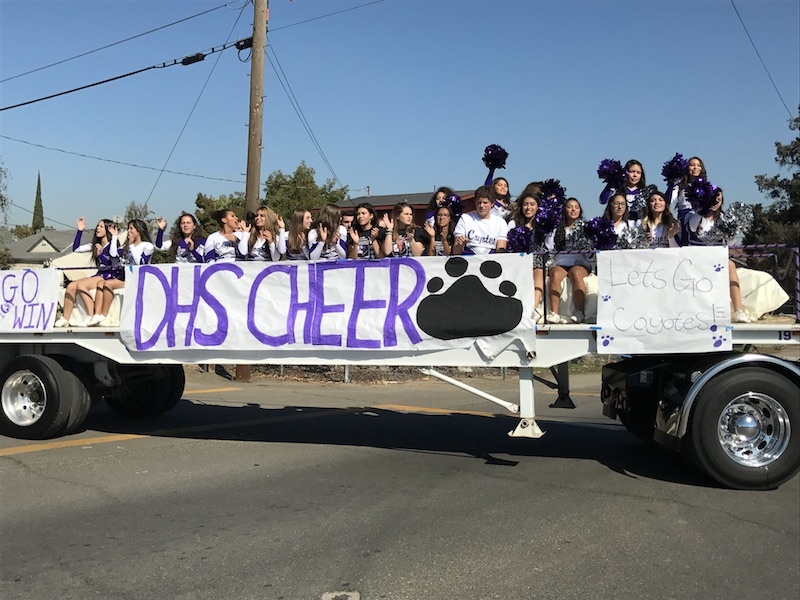 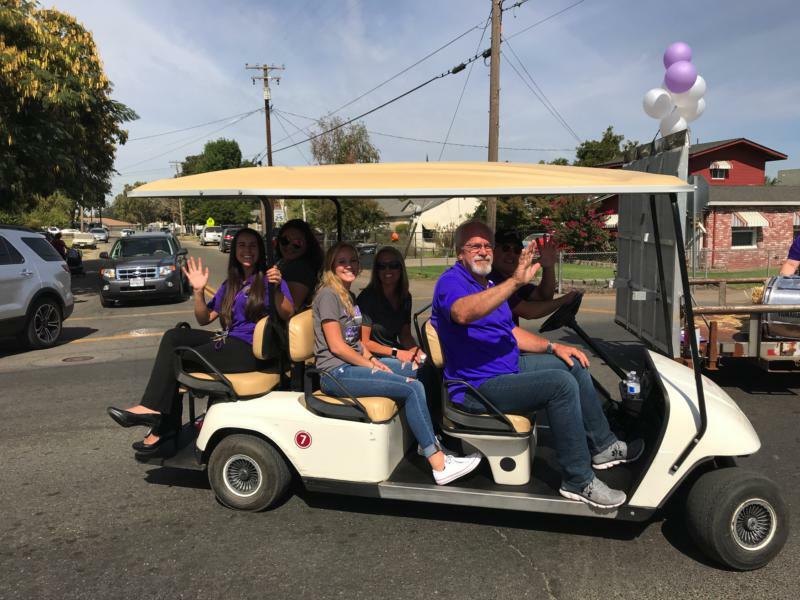 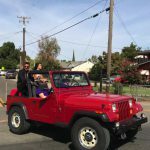 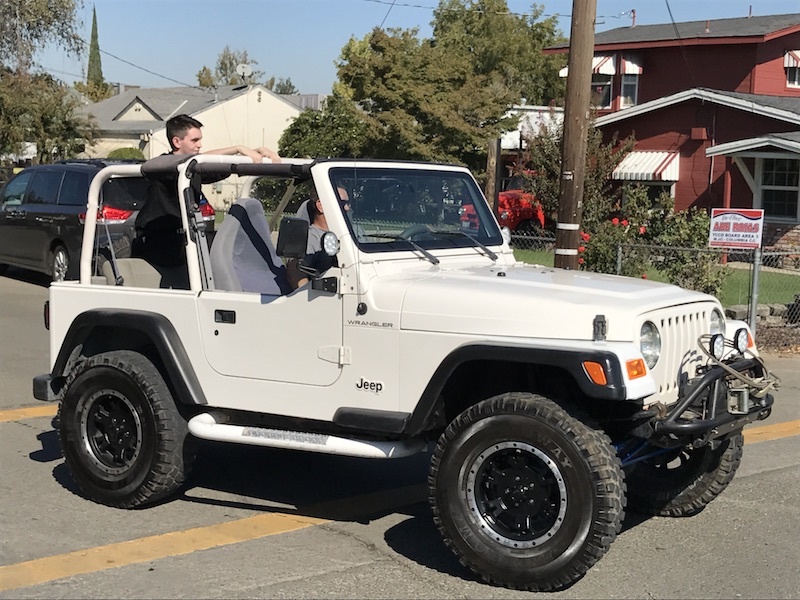 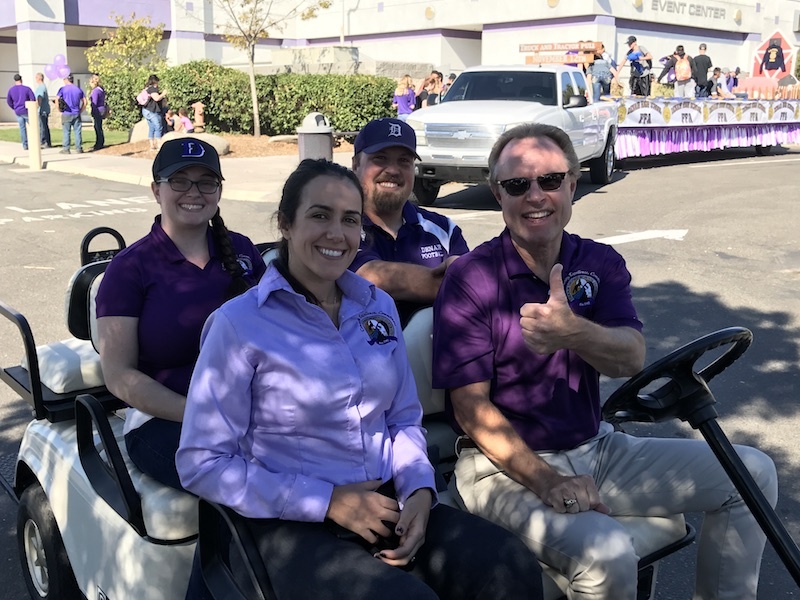 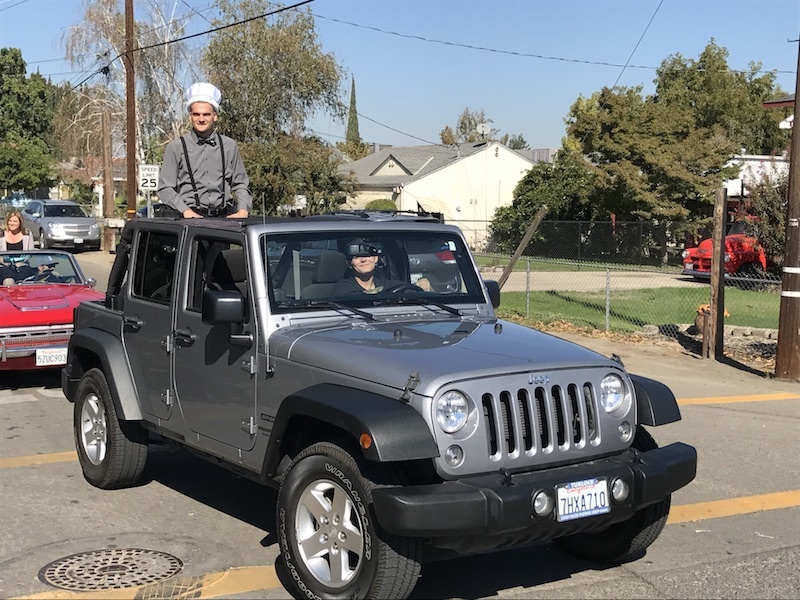 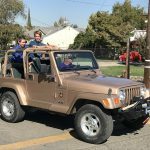 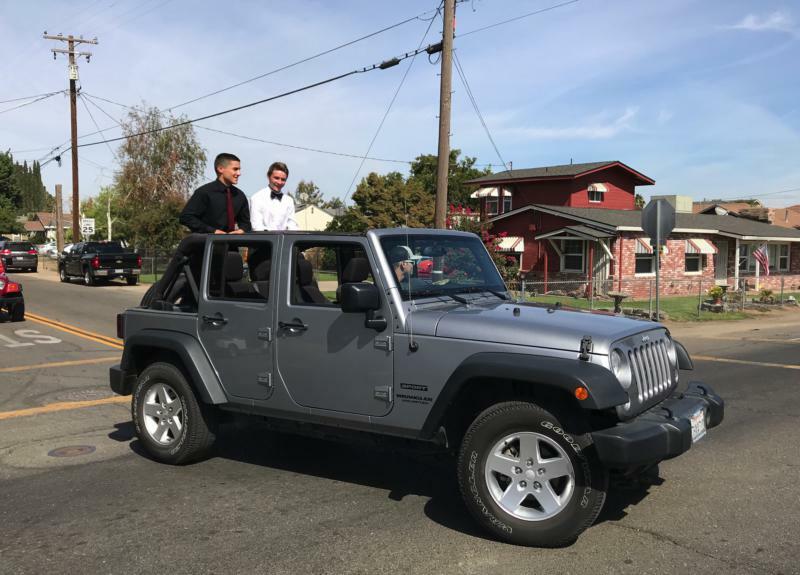 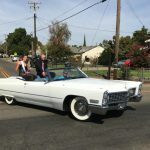 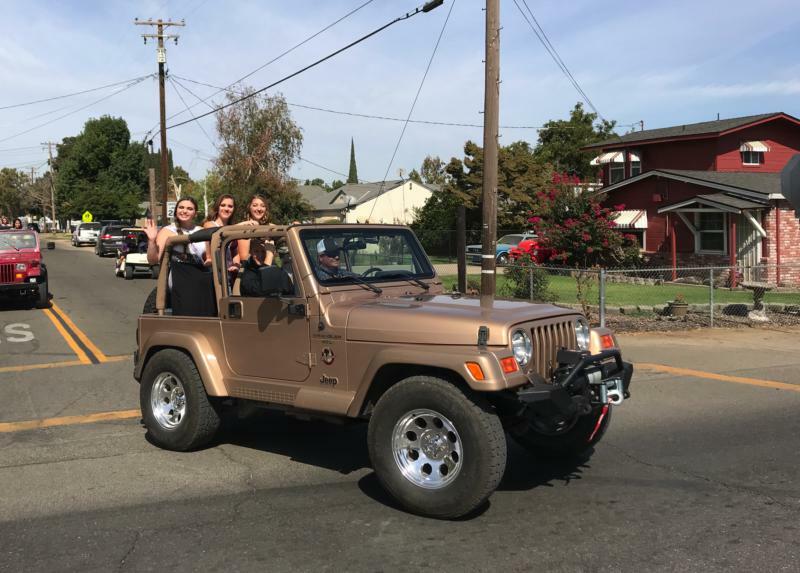 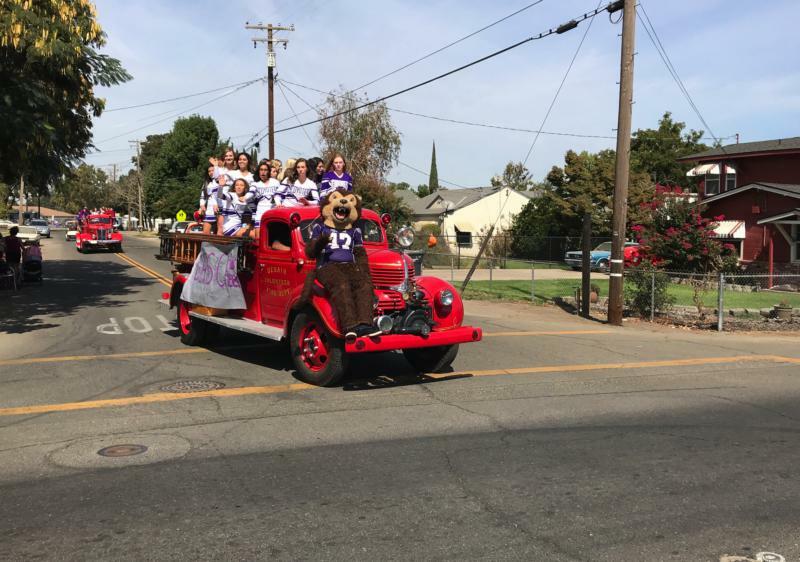 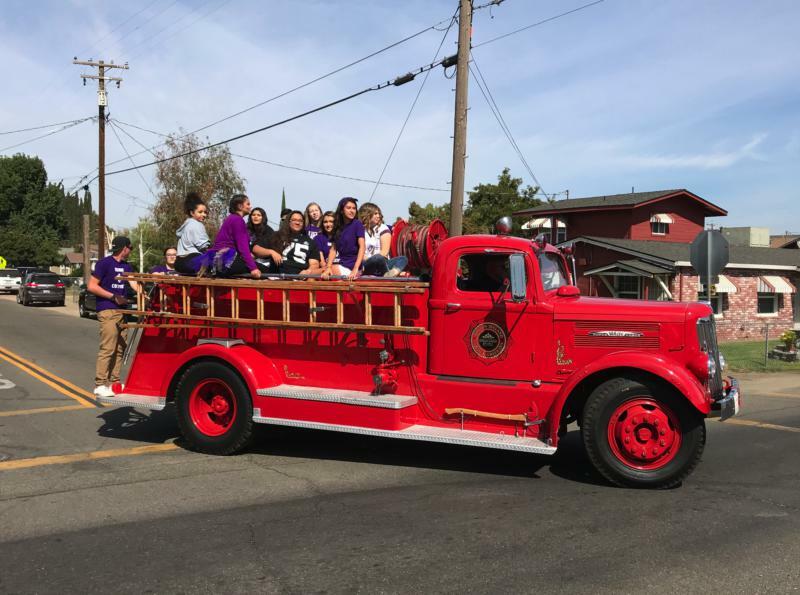 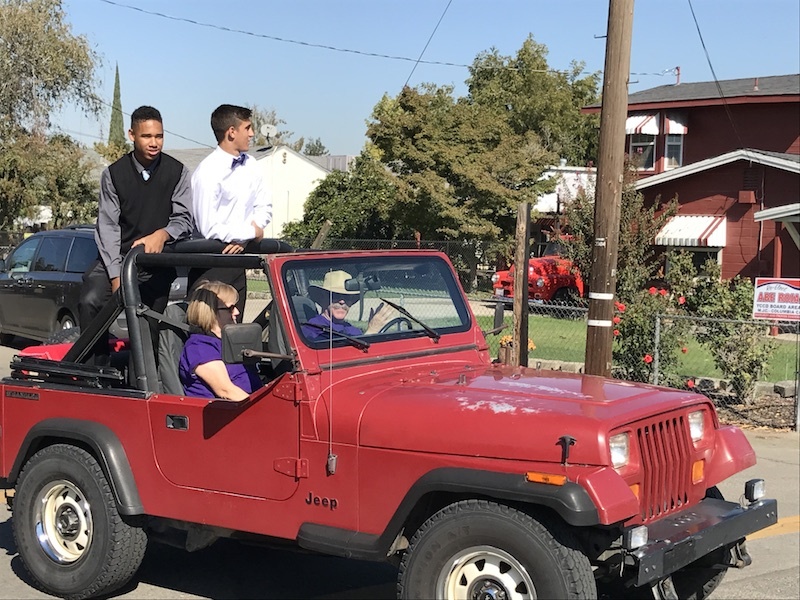 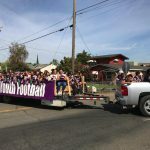 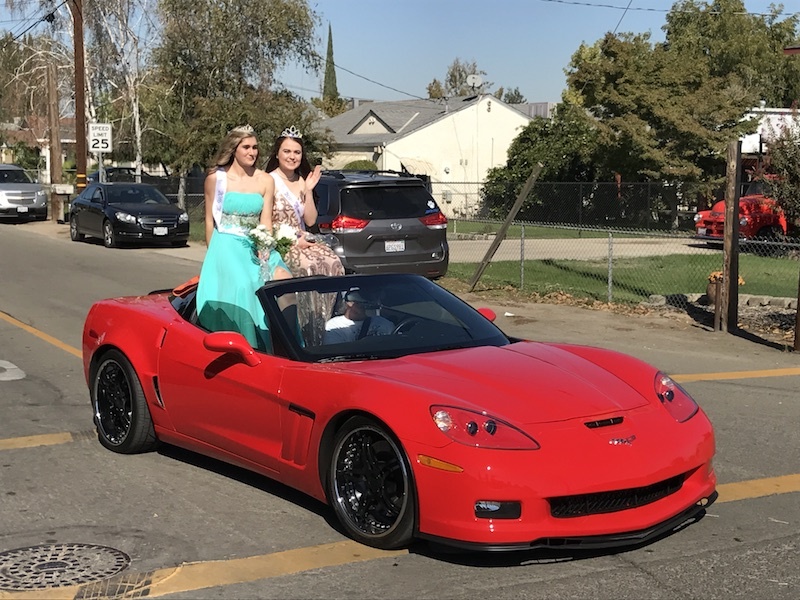 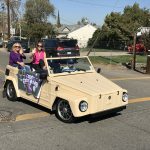 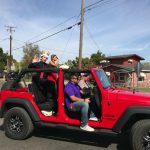 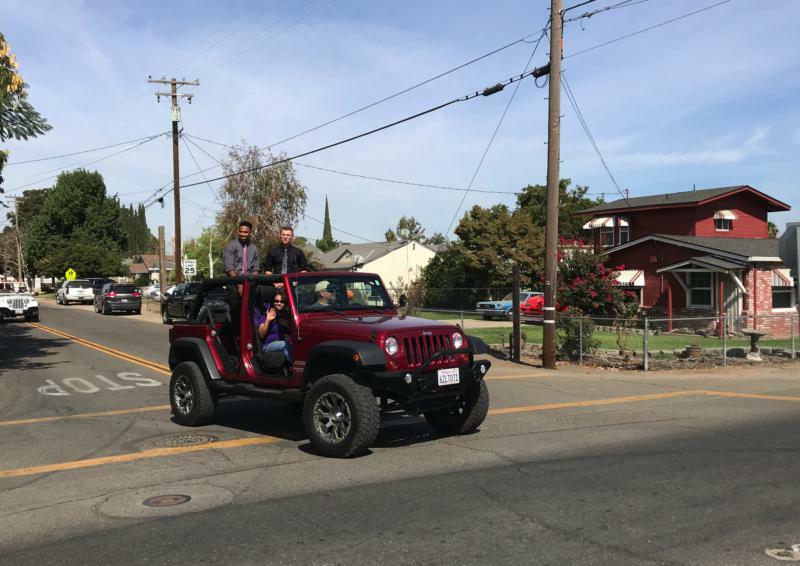 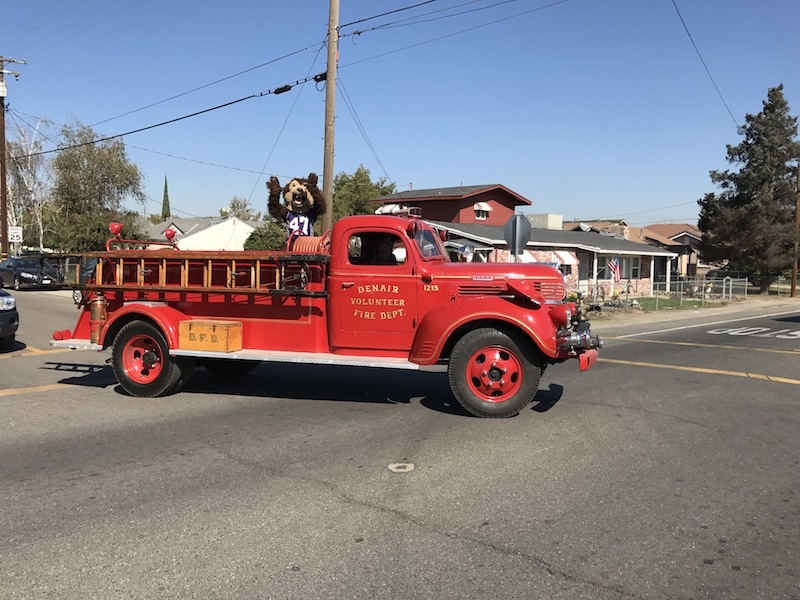 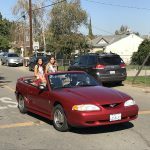 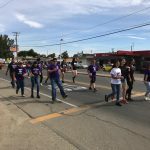 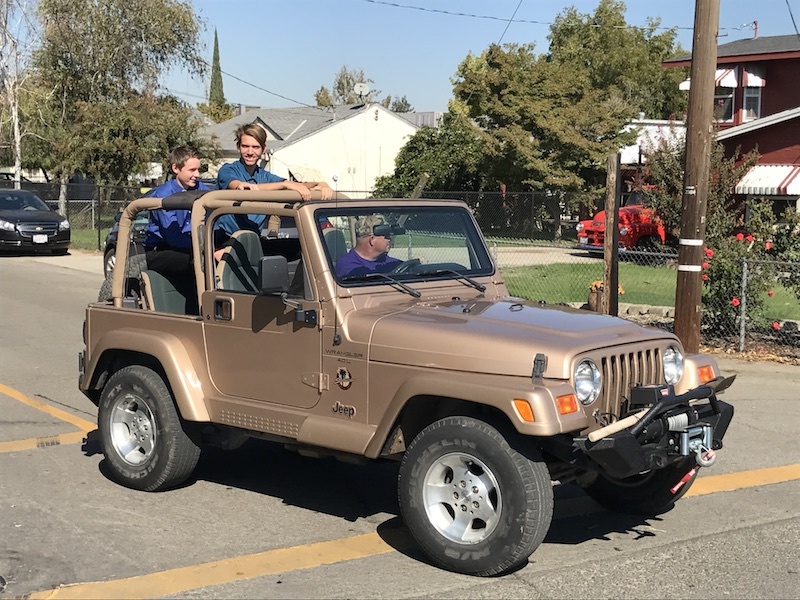 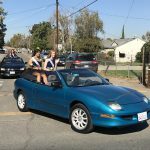 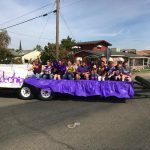 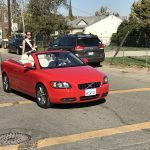 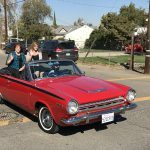 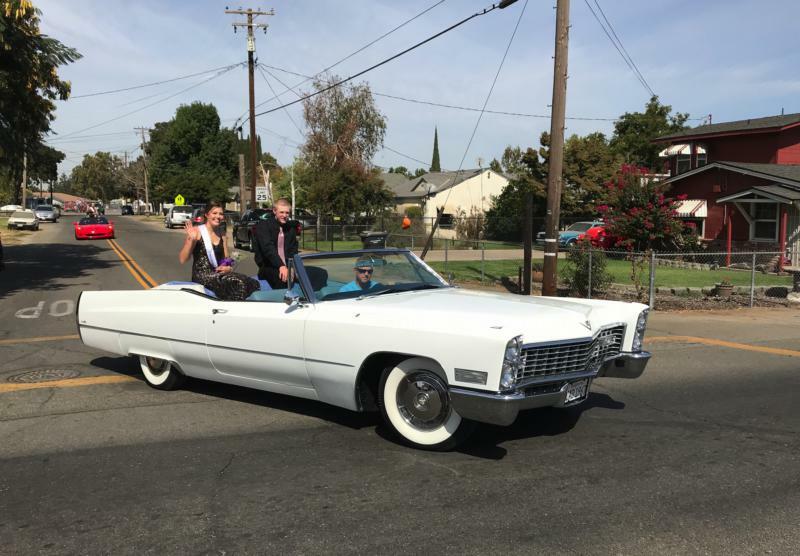 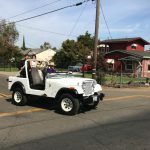 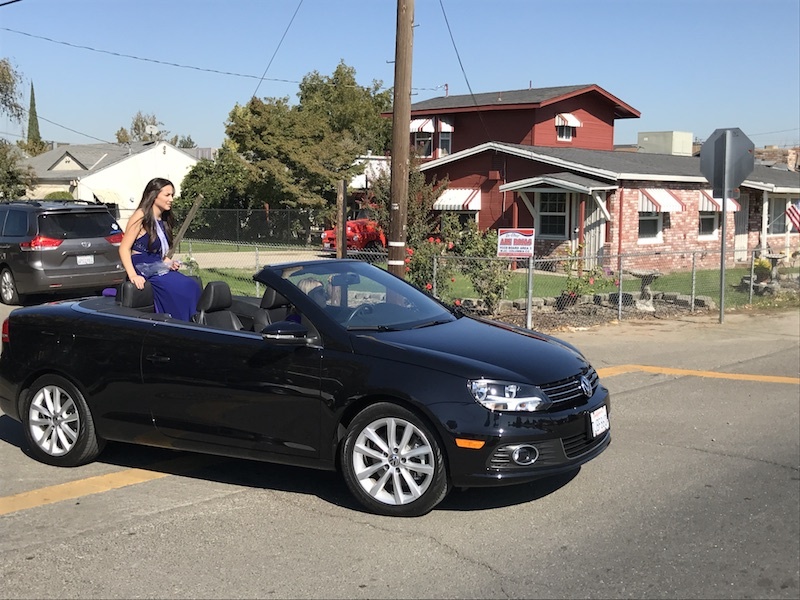 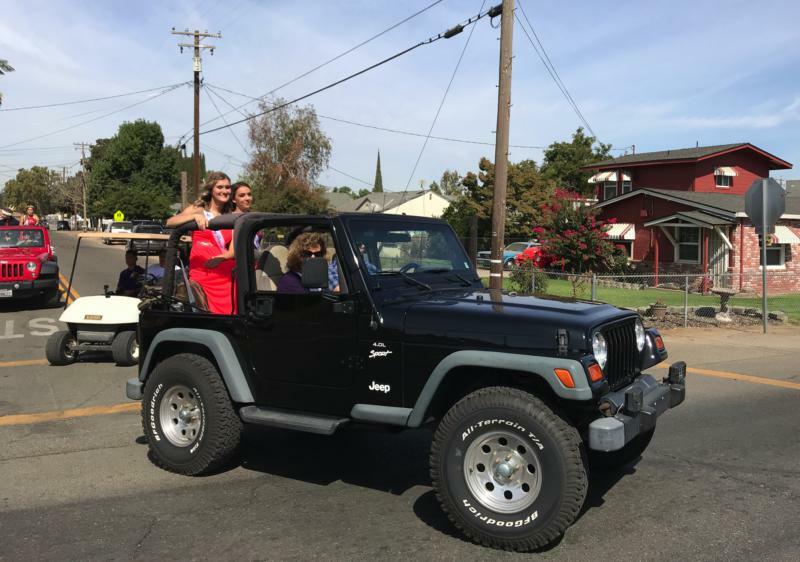 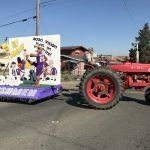 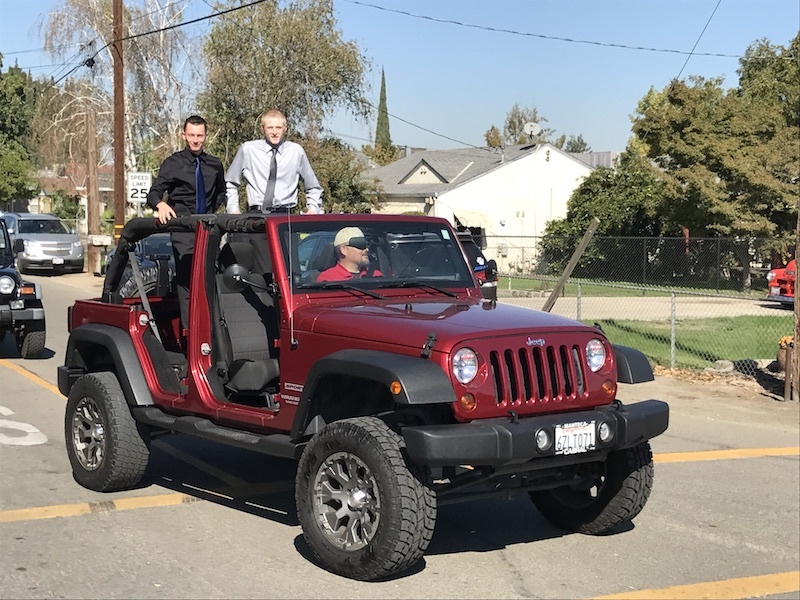 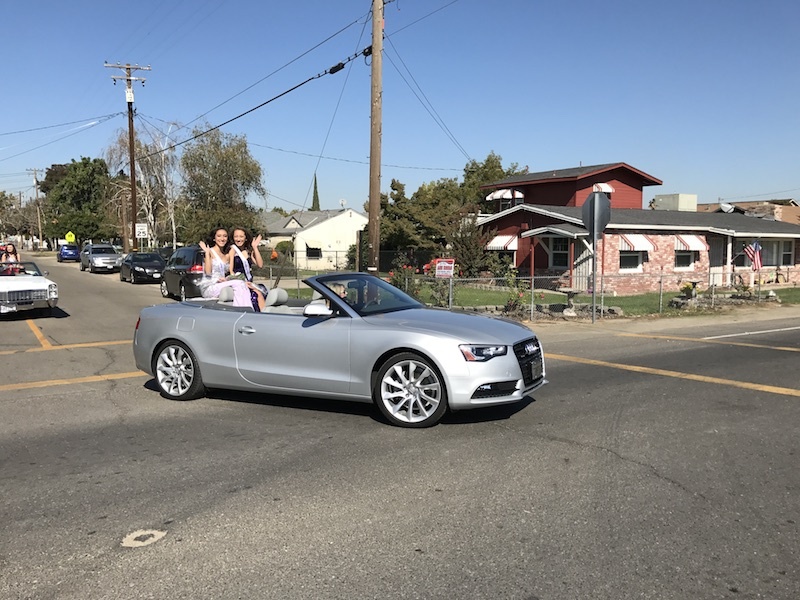 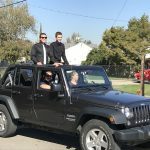 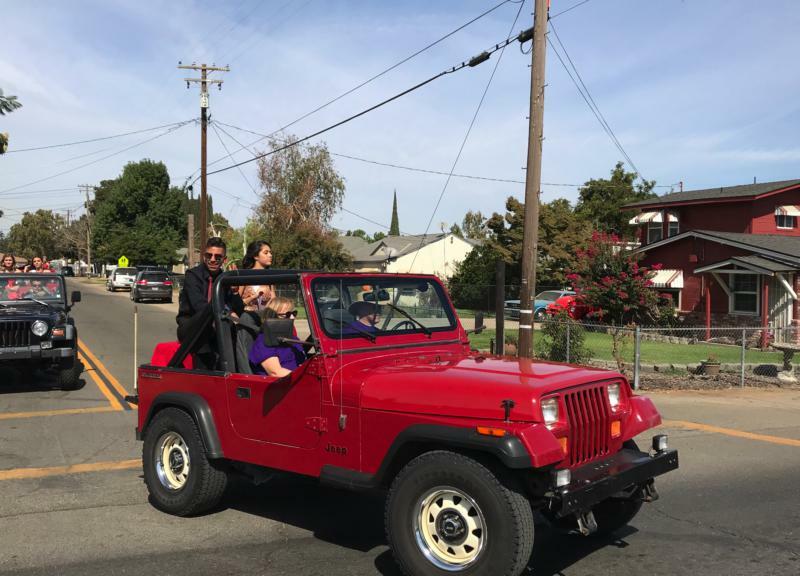 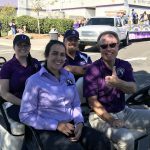 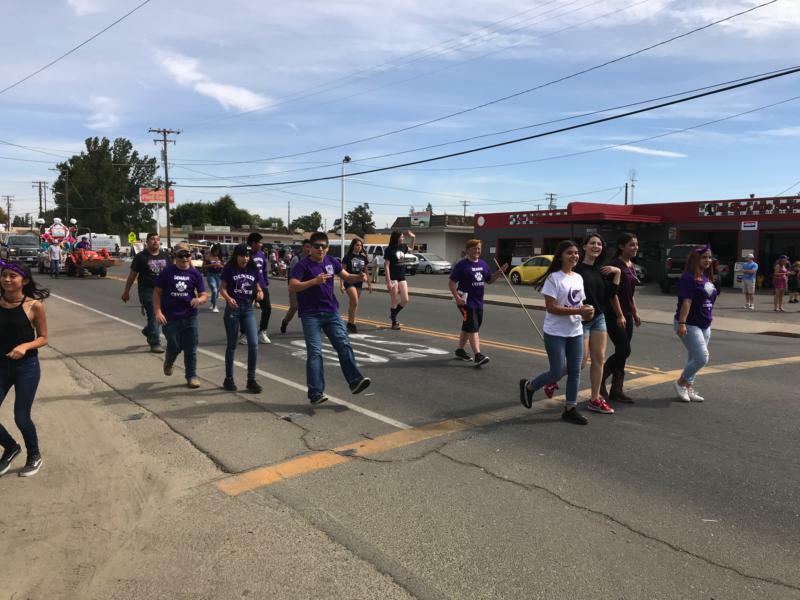 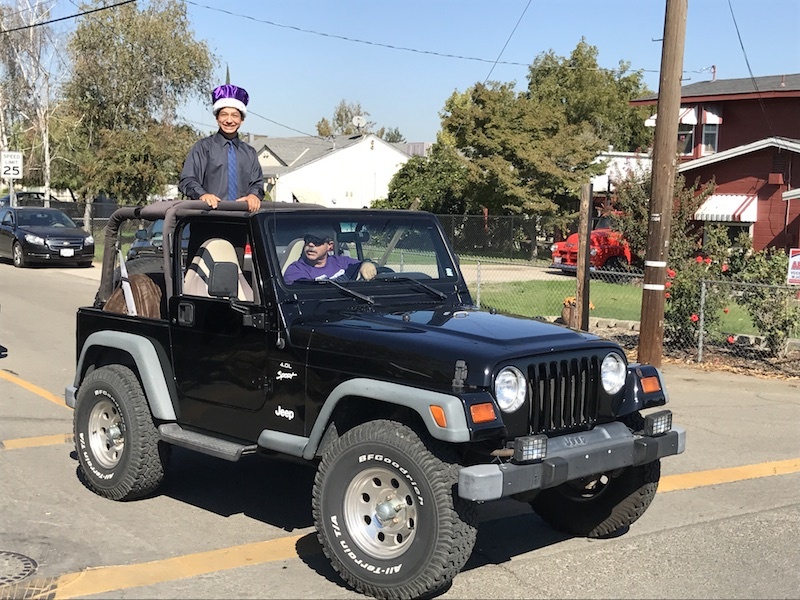 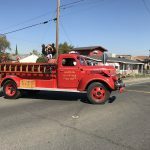 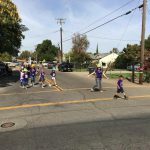 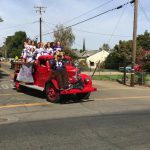 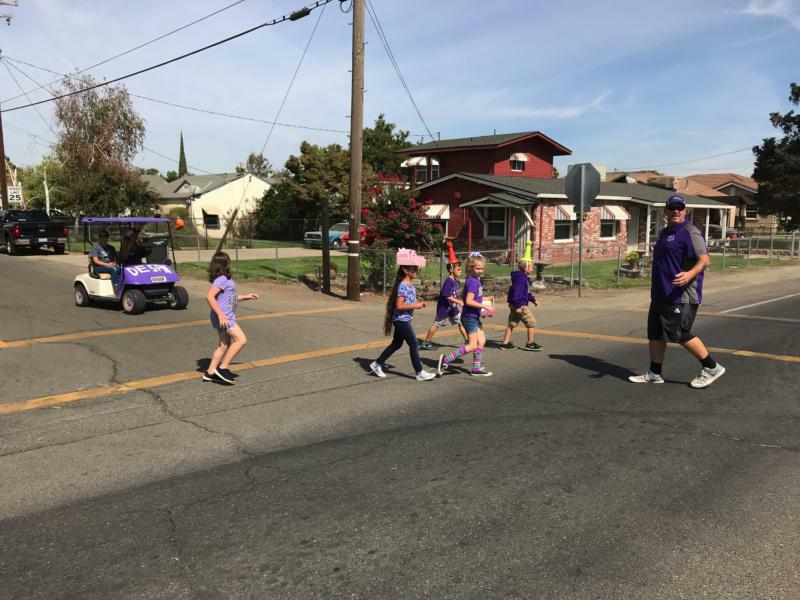 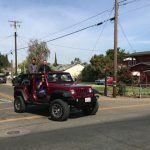 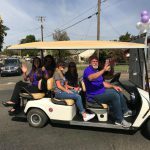 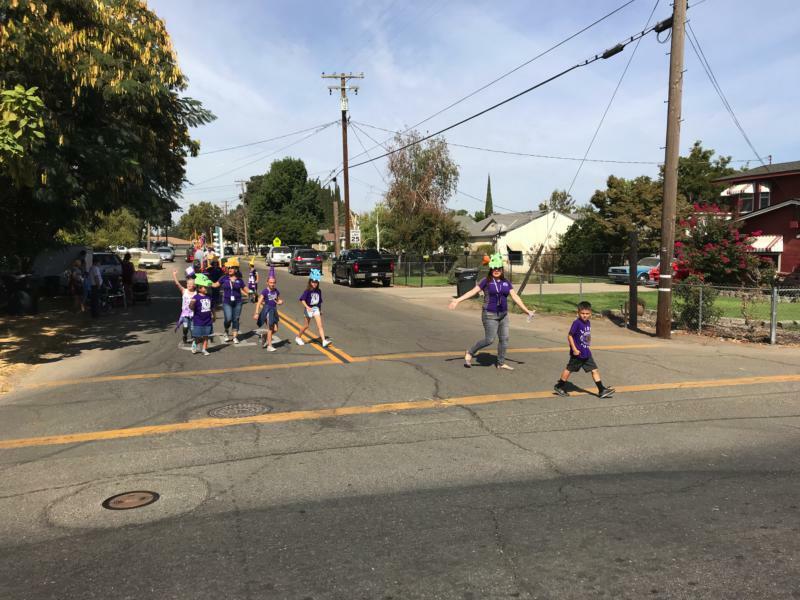 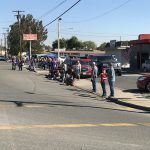 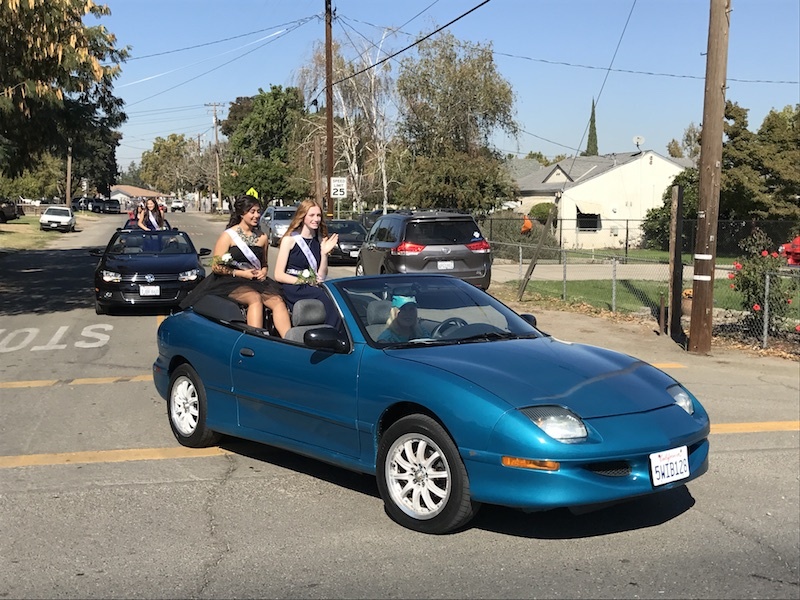 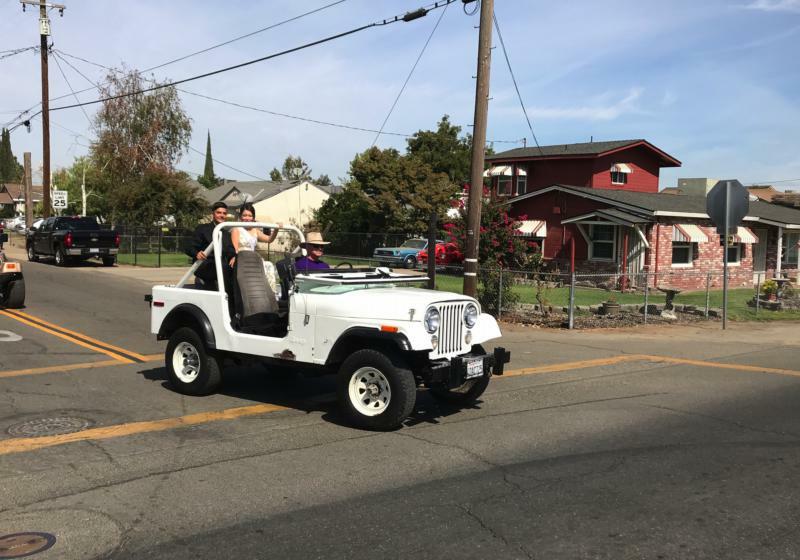 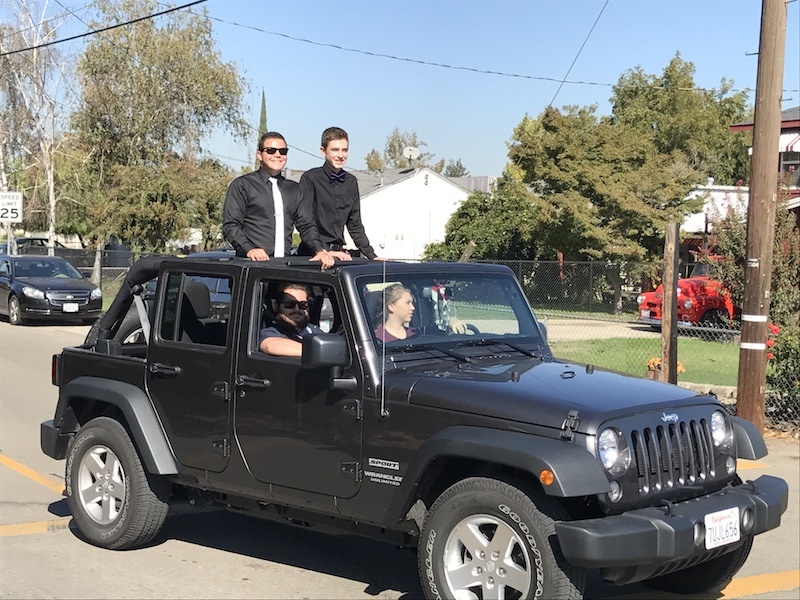 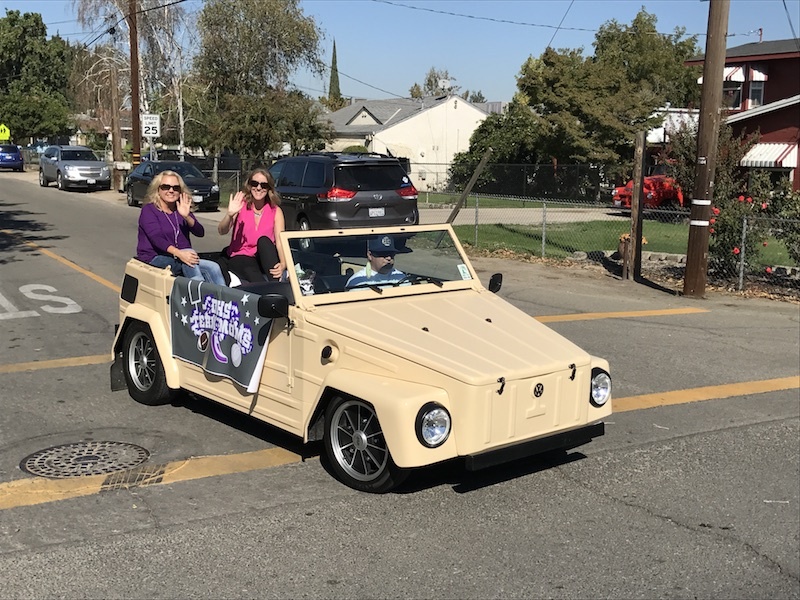 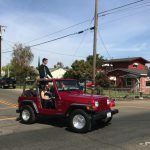 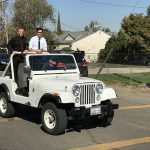 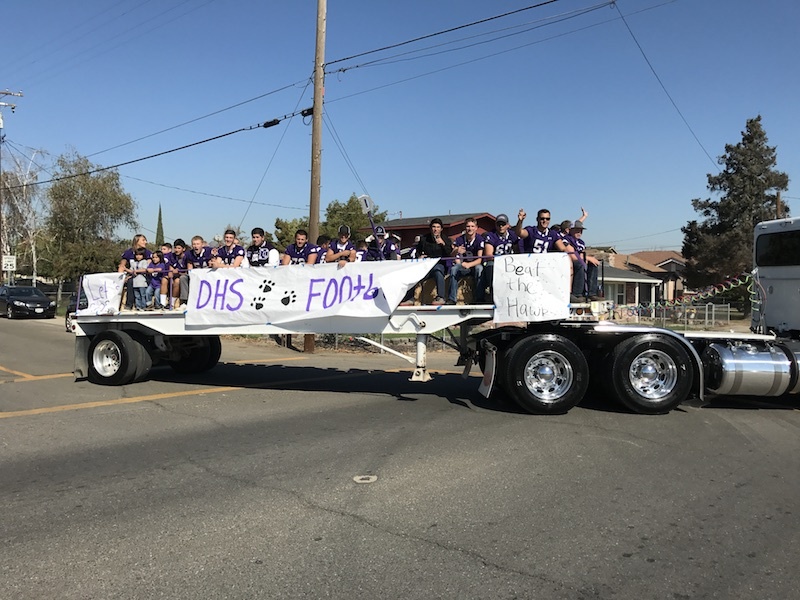 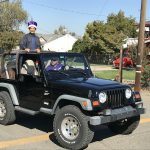 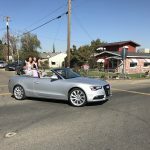 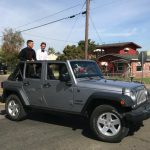 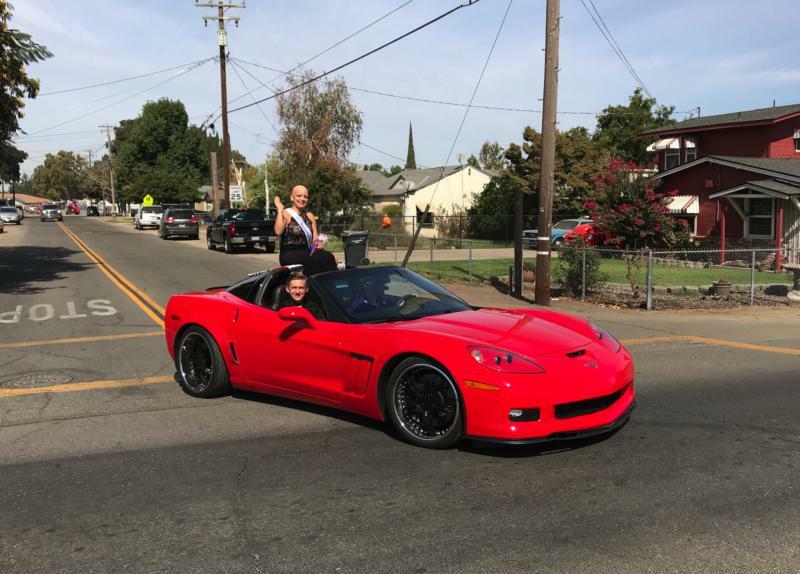 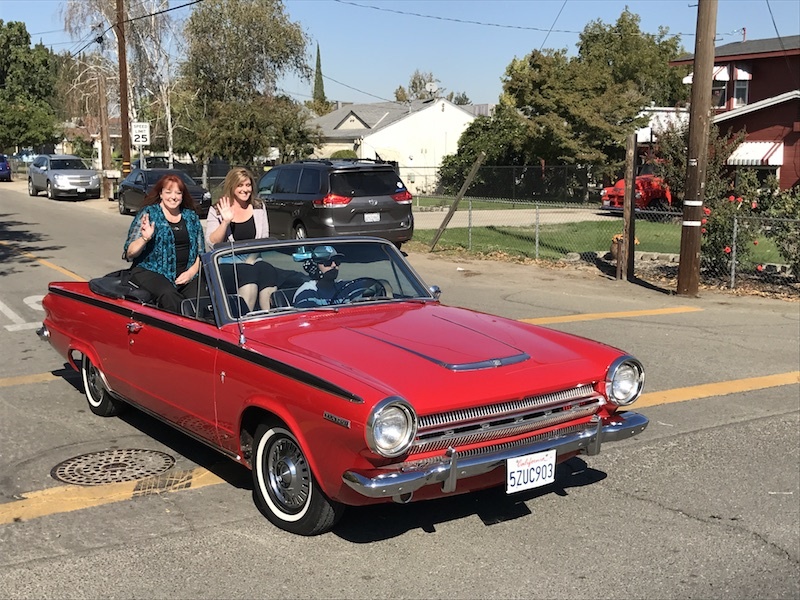 Denair High School celebrated its 2018 football homecoming with a community parade on Friday afternoon. 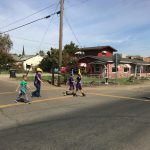 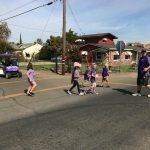 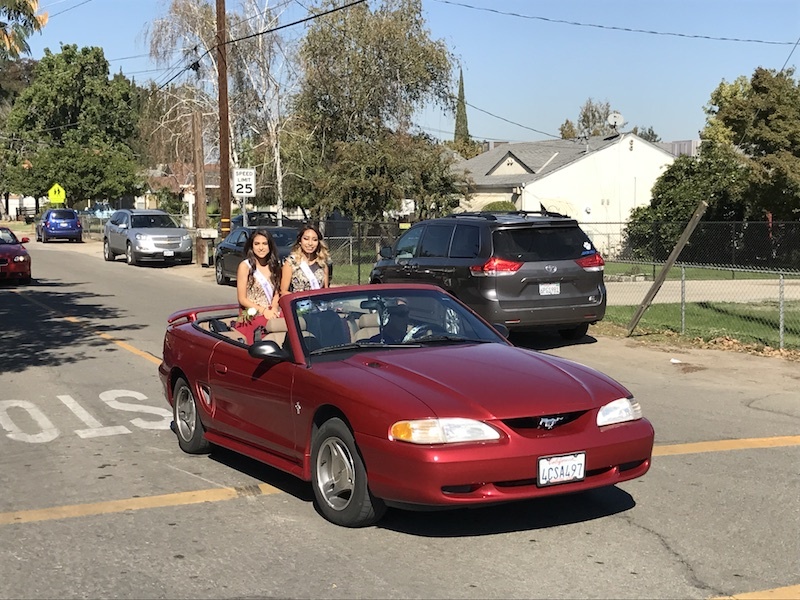 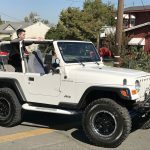 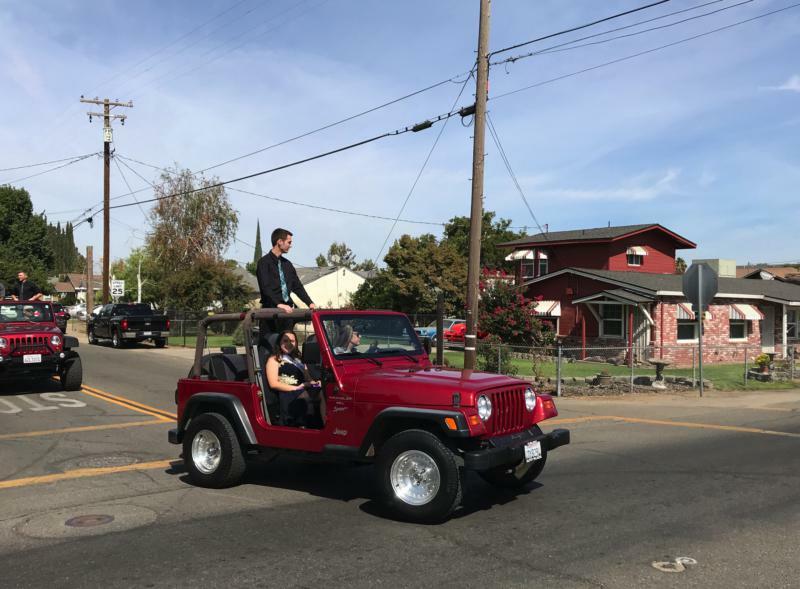 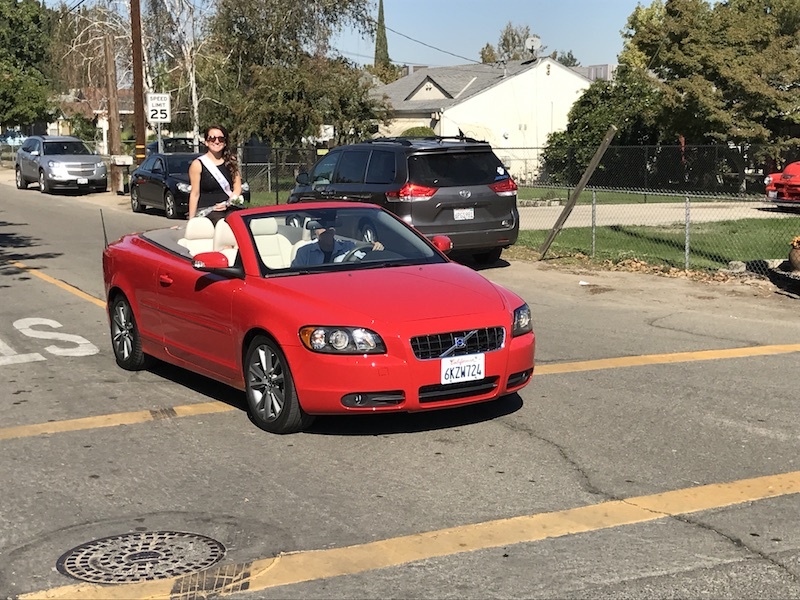 The procession started Down Coyote Way to Denair Elementary Charter Academy, turning down Fresno Street, before returning to the High School. 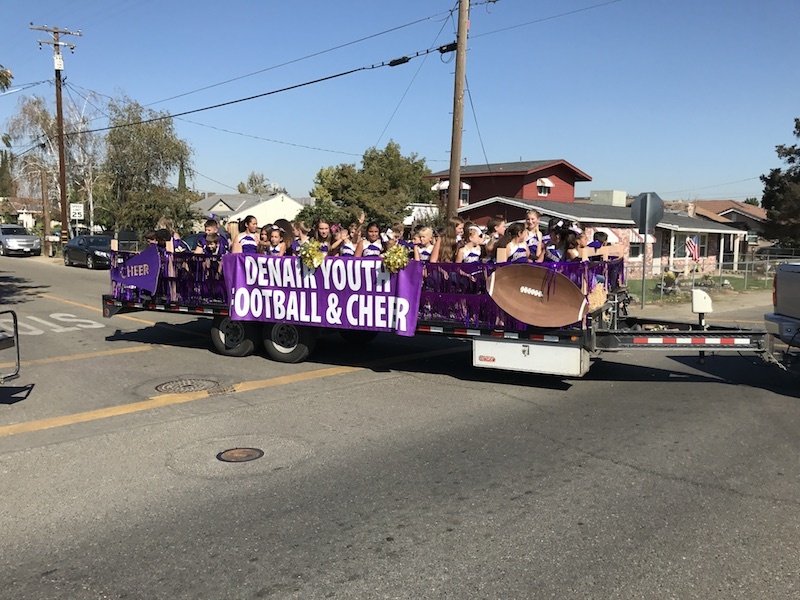 The Denair High School Band led the parade followed by FFA, the homecoming court, class floats, and the football teams and cheerleaders. 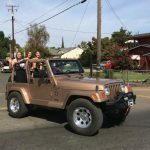 A photo gallery is available for your viewing pleasure. 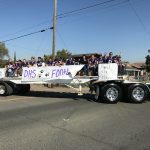 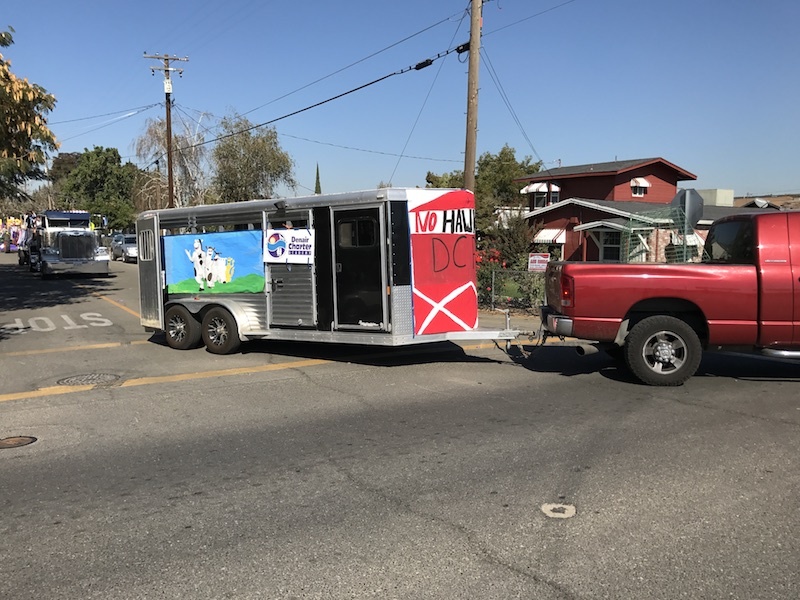 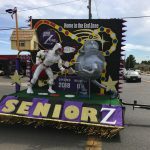 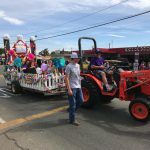 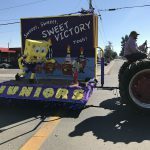 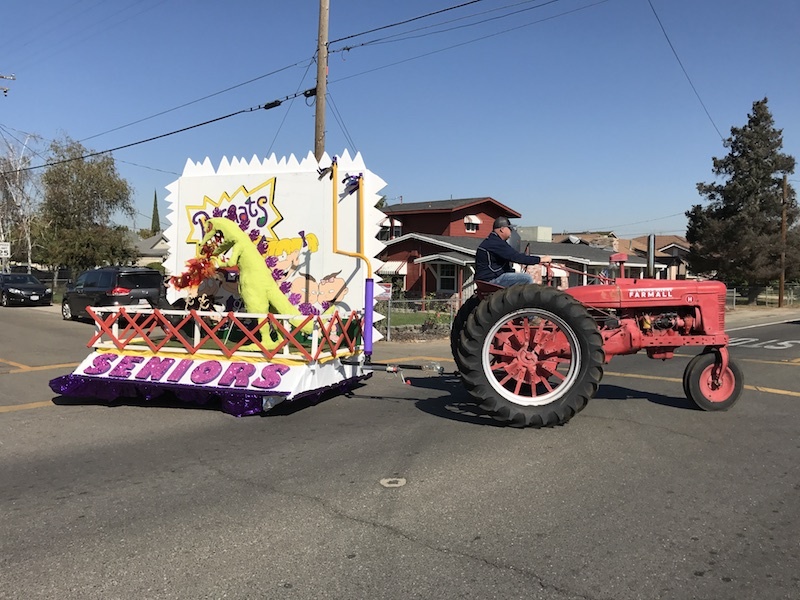 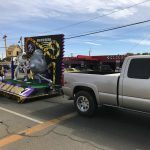 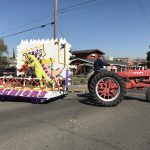 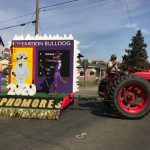 Not only is Delhi’s football team winless on the field this season, the Hawks also are taking a beating this week on the Denair High School homecoming floats. 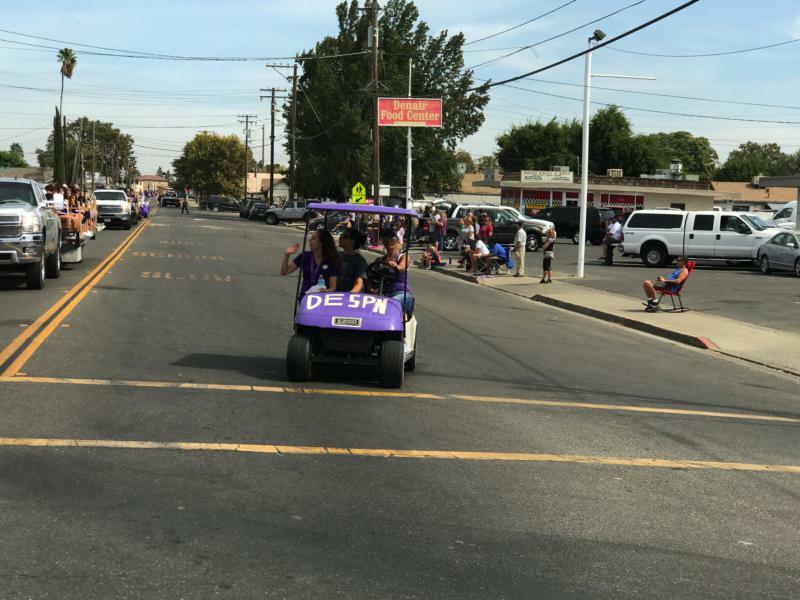 In keeping with a video game theme, poor Delhi is getting hammered by the freshmen (“Super Smash Brothers”), gobbled up by the sophomores (“Pac-Man”), barrel rolled by the juniors (“Donkey Kong”) and run over by the seniors (“Mario Kart”). 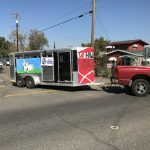 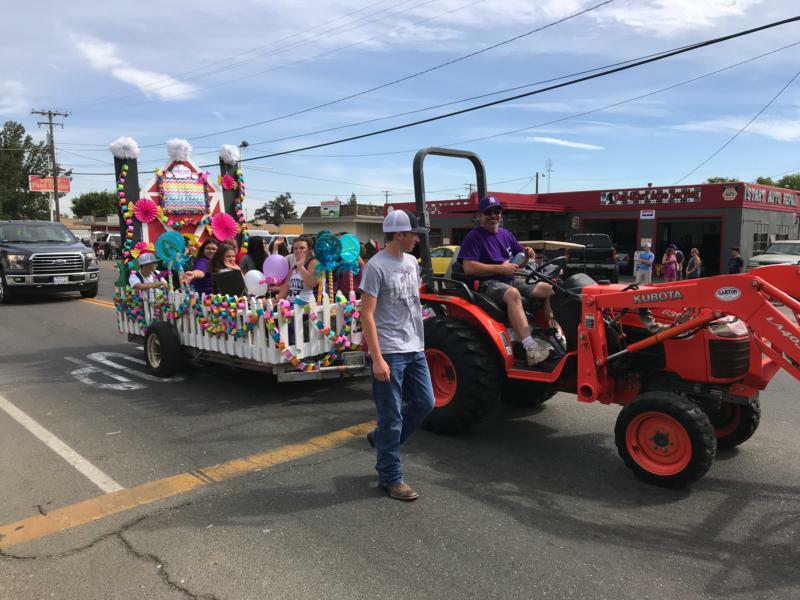 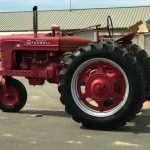 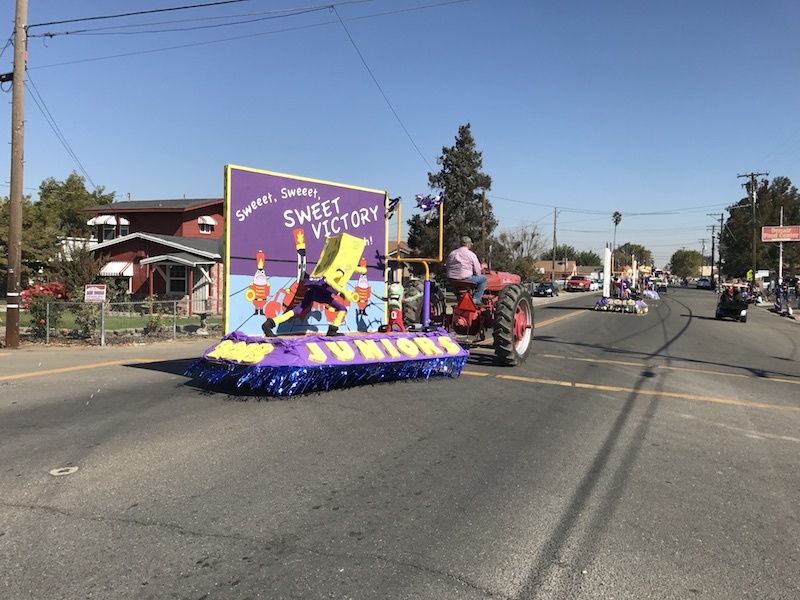 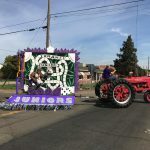 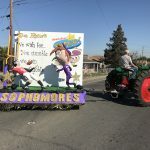 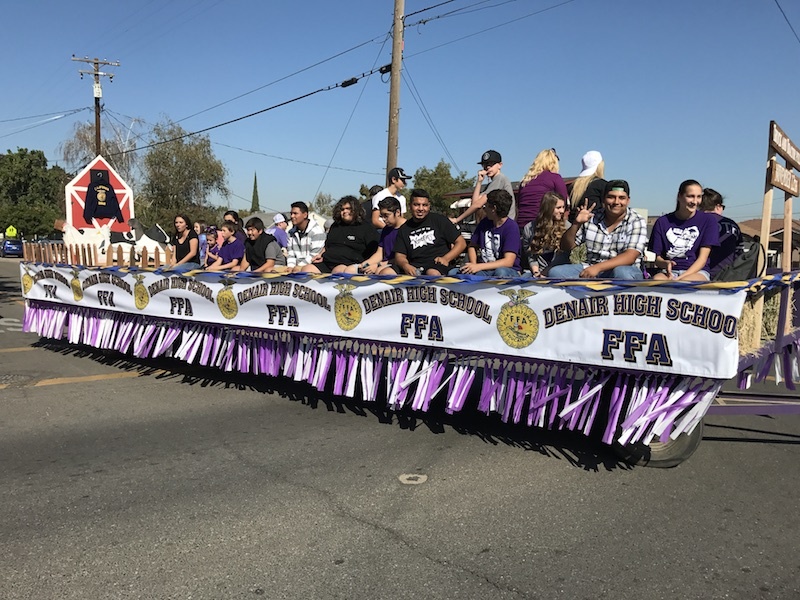 The floats are the products of the imaginations, artistry, and skill of Denair’s leadership team, plus some nifty welding work by students in the Advanced Ag Mechanics class, painting, and construction done by art students. 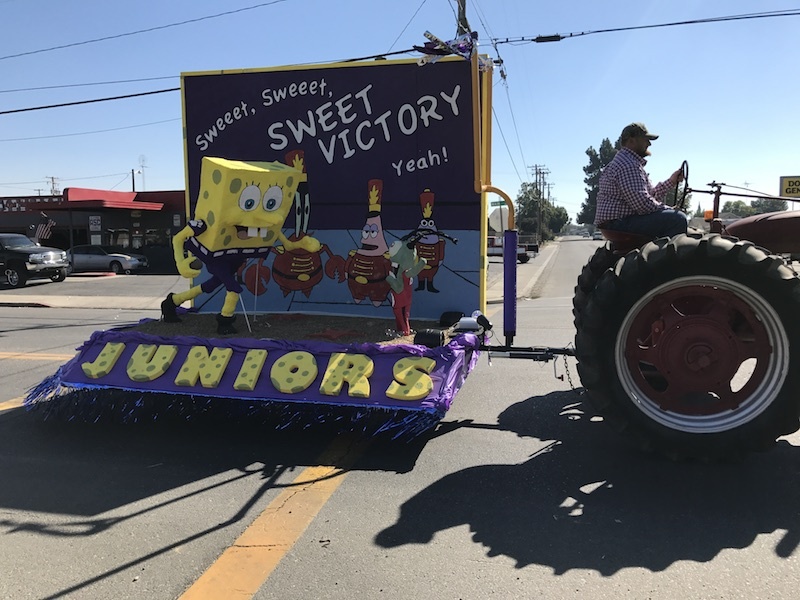 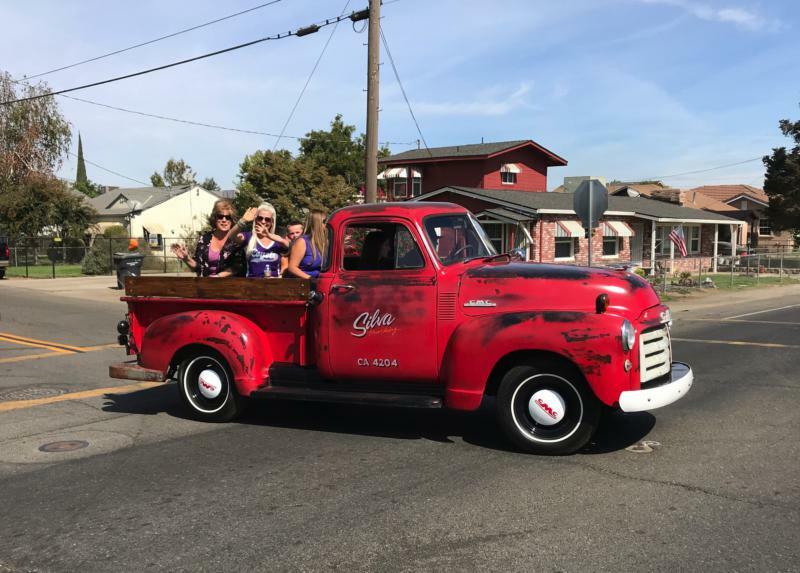 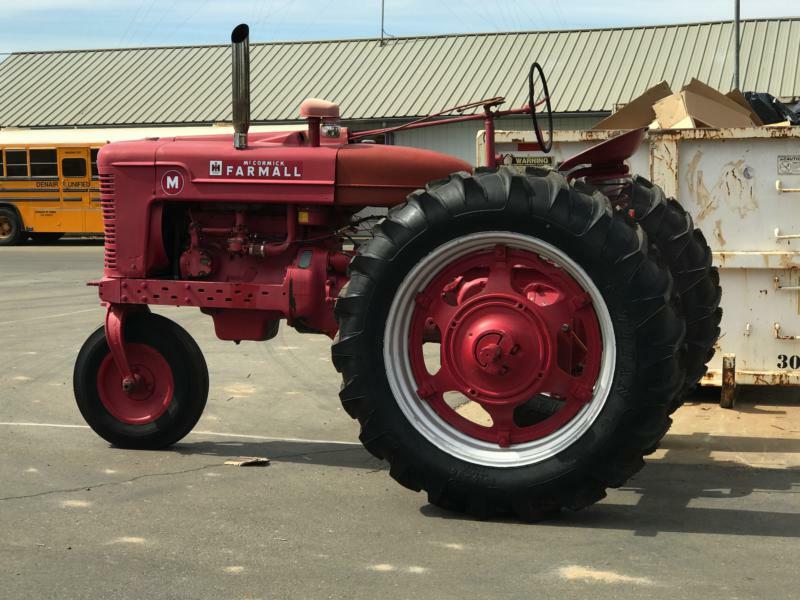 The floats will be on display during the annual homecoming parade Friday, which begins at 11:45 a.m. and runs from the high school campus to Main Street into town and back. 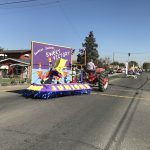 The parade follows a rally at 10:50 a.m. during which kings and queens will be crowned. 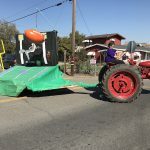 Work on the floats began more than a month ago and wrapped up Tuesday. 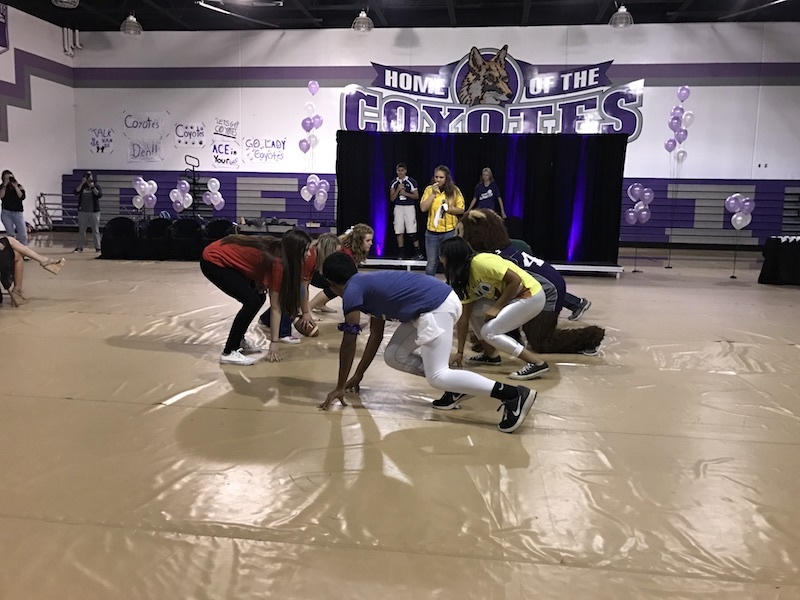 Students in Robyn Hilton’s leadership class first brainstormed about a theme. 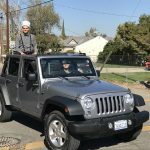 They chose classic video games, many of them popular when their parents were toddlers. 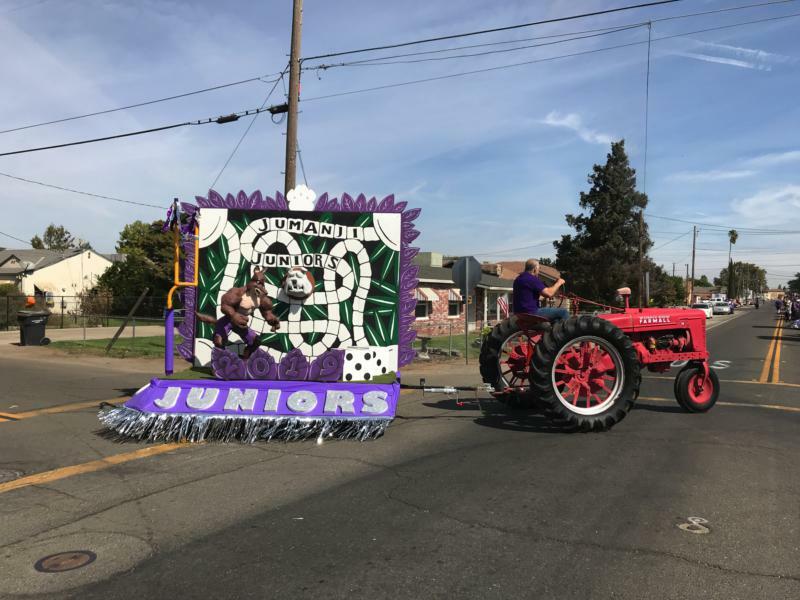 The other floats may have taken slightly longer to conceive, but all reflect the creativity one would expect of teens enthused about homecoming. 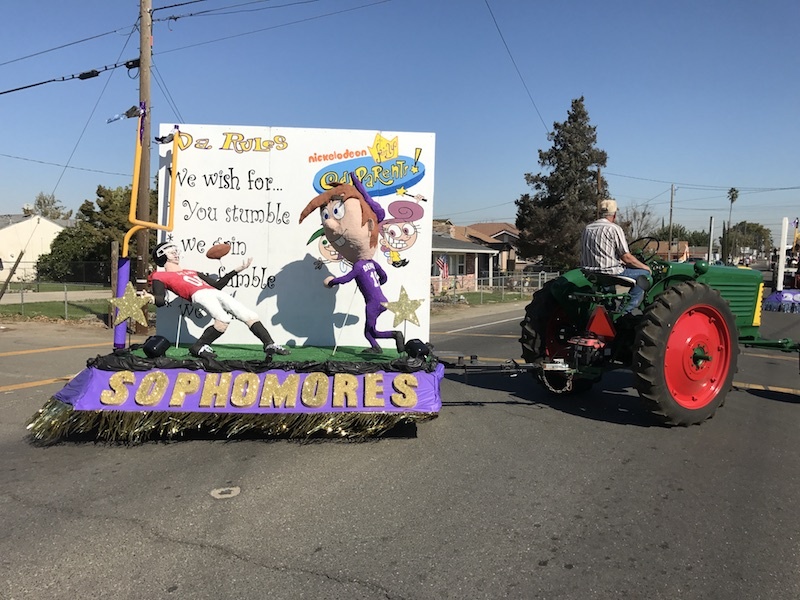 The freshmen – led by Jack Henderson, Preston Roe, and Makena Padgett – crafted a “Super Smash Brothers” float with a muscular Coyote using a hammer to pummel an unwitting Hawk. 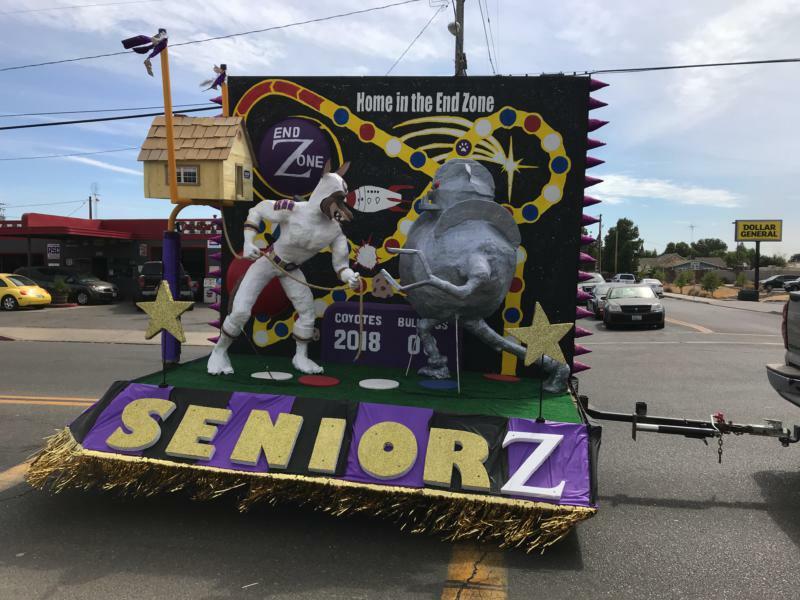 The sophomores – with Madelyn Brammer and Haley Hultgren in charge – have a gigantic purple “Pac-Man” orb about to munch a Hawk ghost. 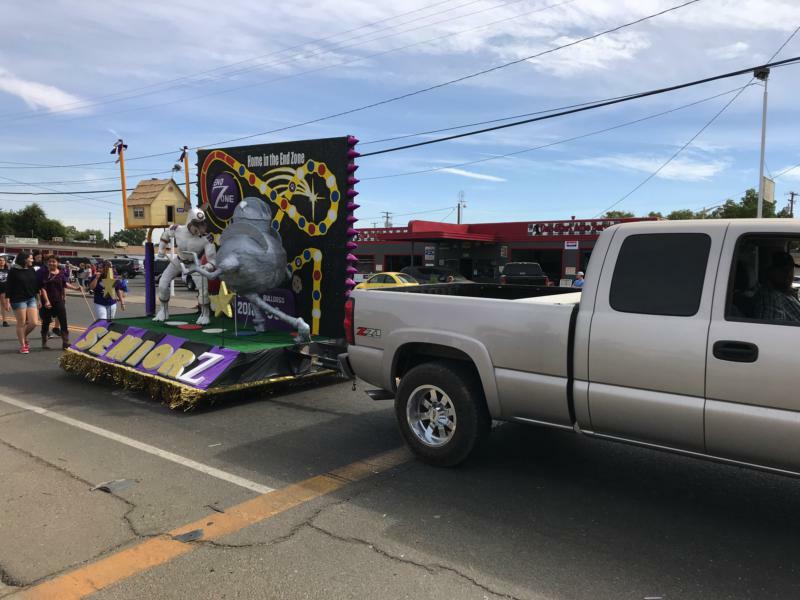 On the back, the words “Beware the Pac” are painted, a sly reference to a pack of coyotes as well as the game. 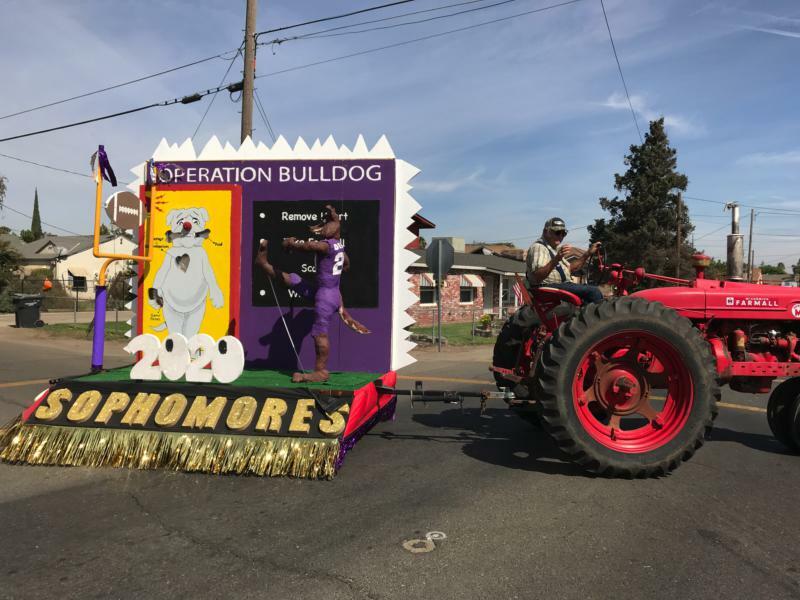 The seniors – led by Adrianna Snyder and Drew Pritchard, but relying on at least a dozen others – created the most intricate design. 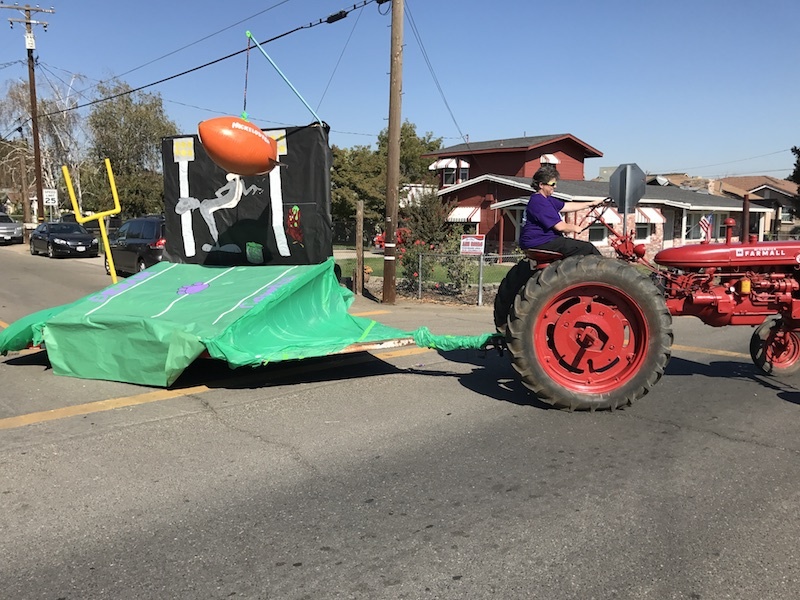 It has two karts welded by Diana Soto, with the one driven by a Coyote upending a hapless Hawk. 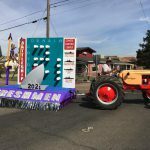 As the defending champs (they won last year as juniors), the class of 2019 might be favored again this week. 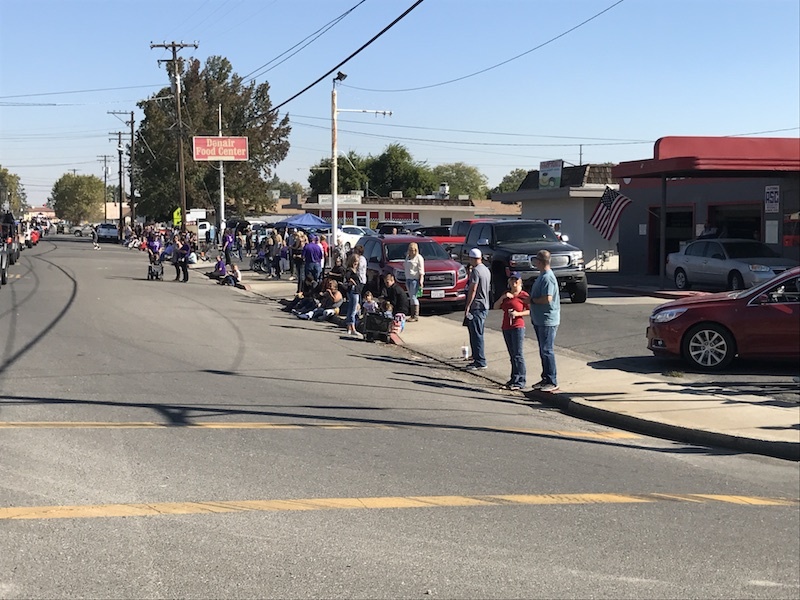 Voting is done by K-8 students on Denair’s other campuses, plus some community members. 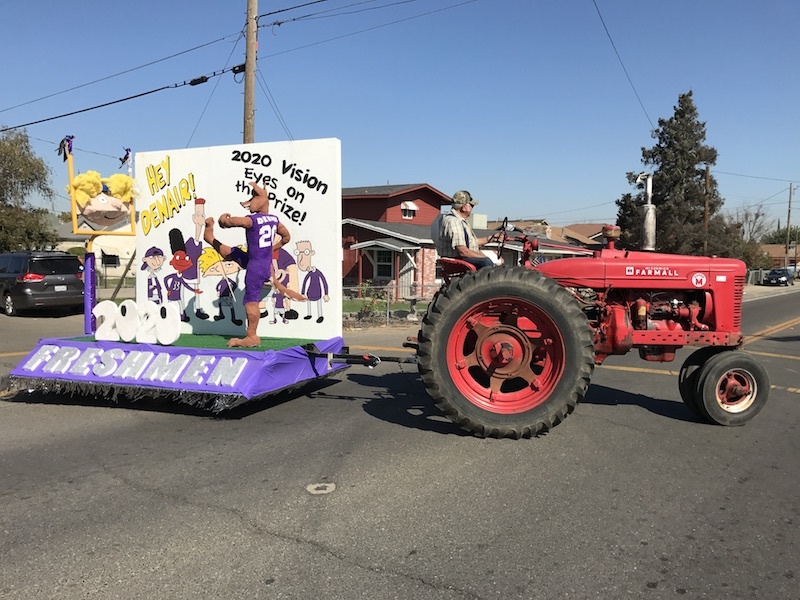 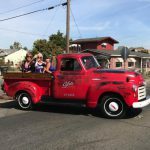 The floats and parade will be a fun part of a day that will culminate with the football game at 7:15 p.m. at Jack Lytton Stadium. 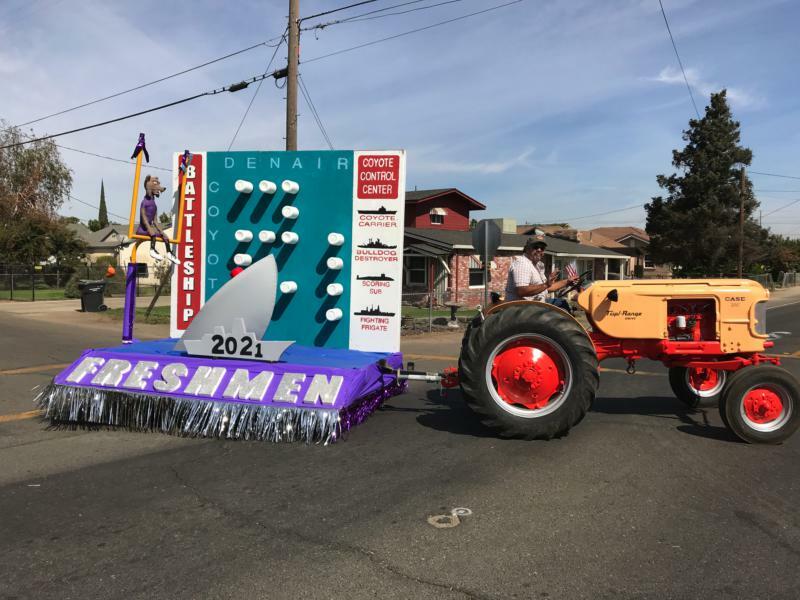 Denair (6-1) is tied for second place in the Southern League with three games to play. 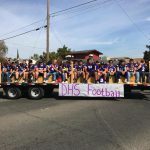 Delhi (0-7) is last. 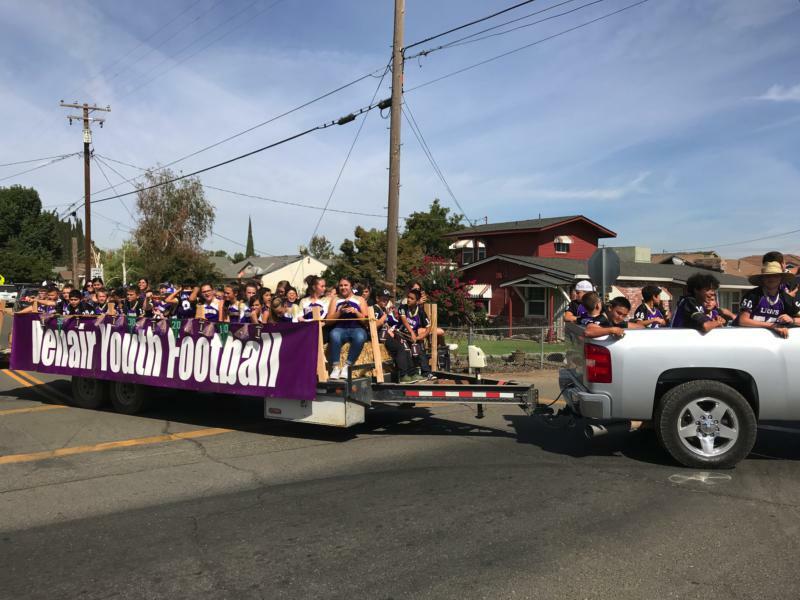 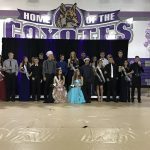 It will be the third of four consecutive homecoming games for the Coyotes – their own Friday, road victories the past two weeks against Gustine and Orestimba, plus the Oct. 19 game at Mariposa. 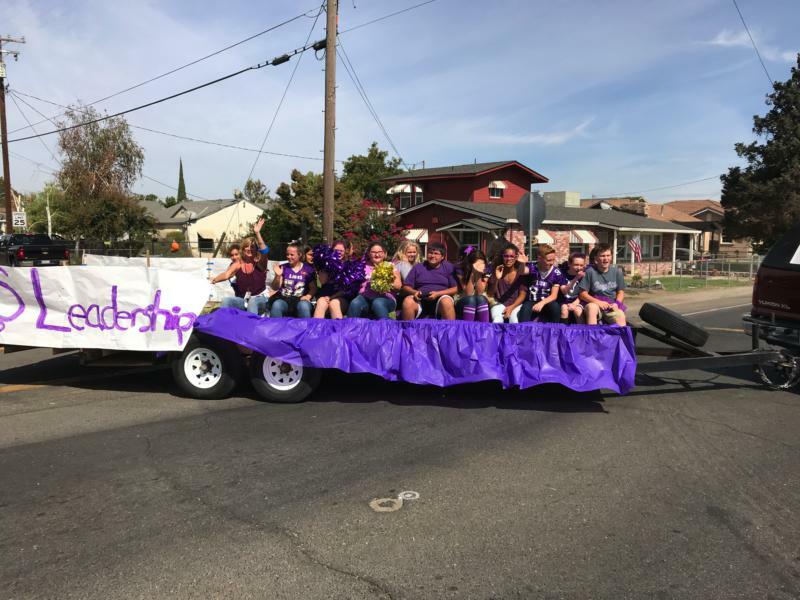 “The kids are talking about going 4-0 in homecoming,” said football Coach Anthony Armas. 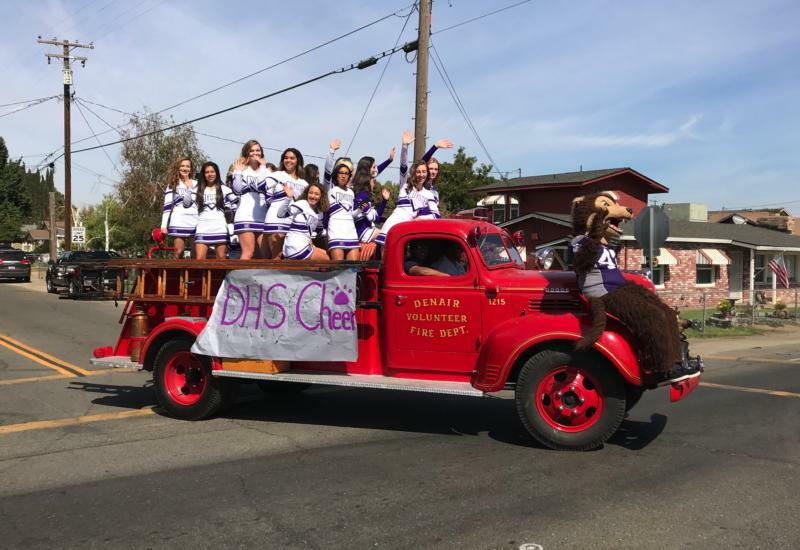 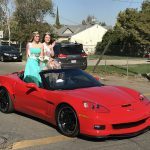 Denair High School celebrated its 2017 football homecoming with a community parade on Friday afternoon. 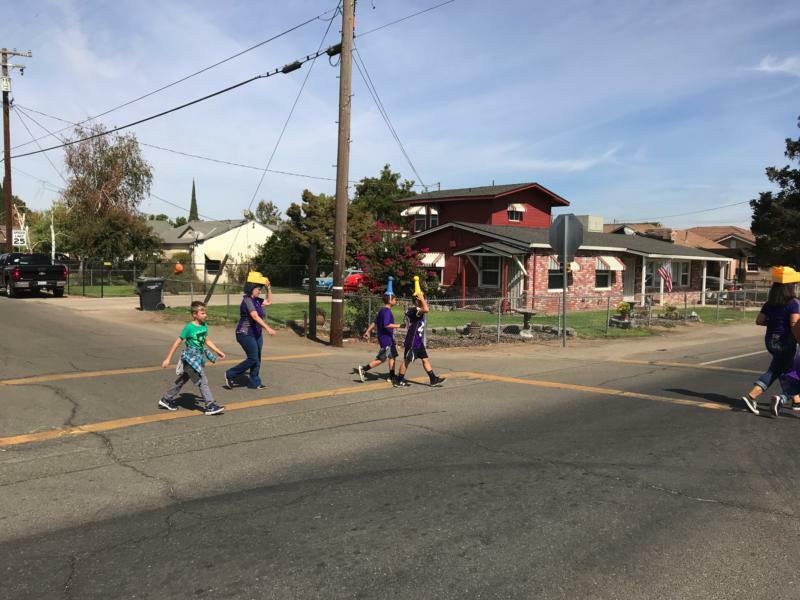 The procession started Down Coyote Way to Denair Elementary Charter Academy, turning down Fresno Street, before returning to the High School. 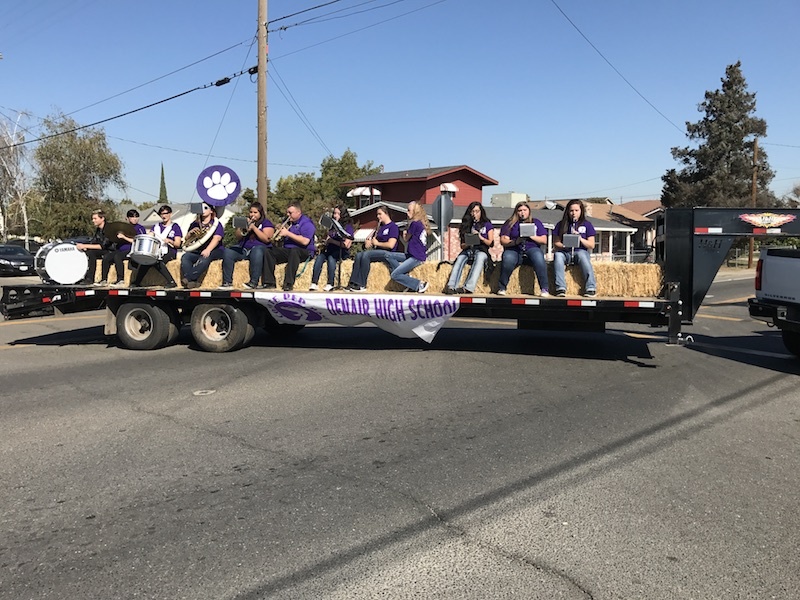 The Denair High School Band led the parade followed by FFA, the the homecoming court, class floats, and the football teams and cheerleaders. 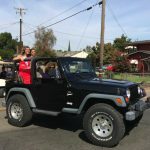 A photo gallery is available for your viewing pleasure. 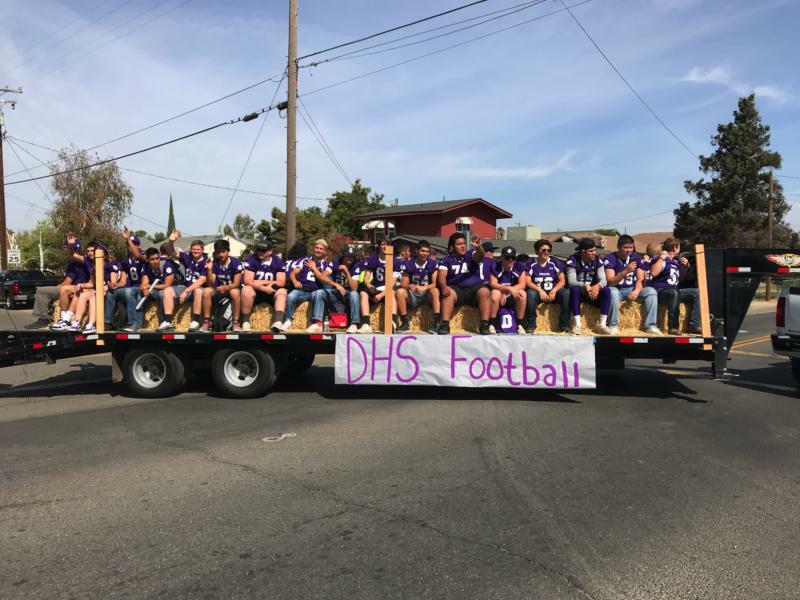 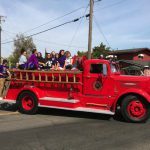 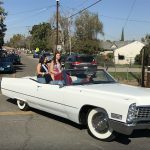 Denair High School celebrated its 2016 football homecoming with a community parade on Friday afternoon. 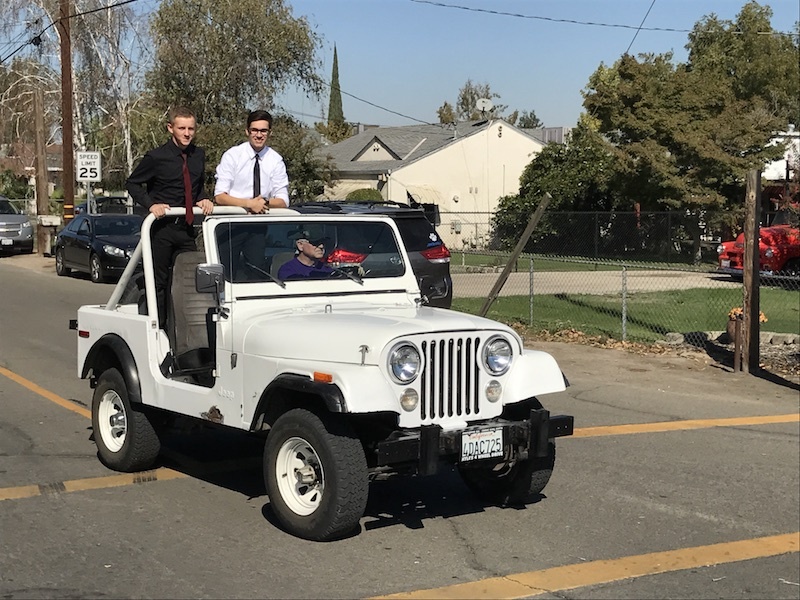 The procession started Down Coyote Way to Denair Elementary Charter Academy, turning down Fresno Street, before returning to the High School. 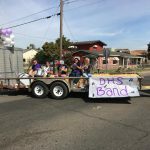 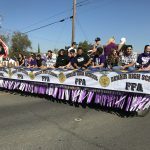 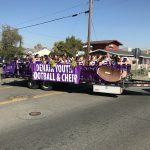 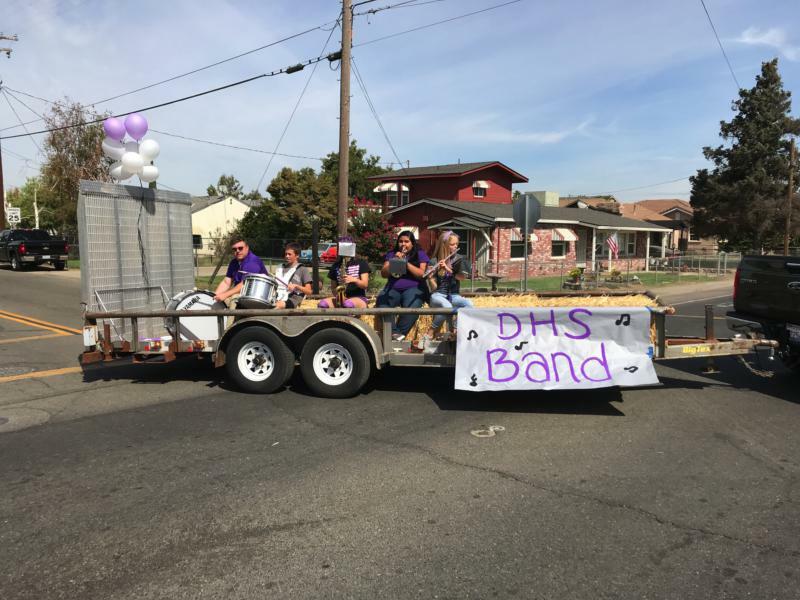 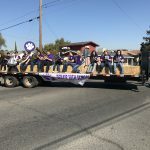 The Denair High School Band led the parade followed by FFA, the team Moms, the homecoming court, class floats, and the football teams and cheerleaders. 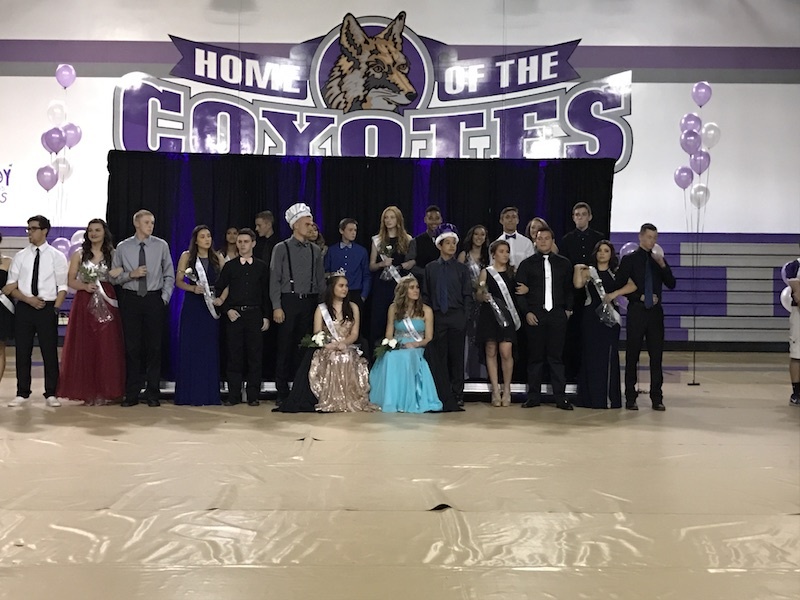 A photo gallery is available for your viewing pleasure.